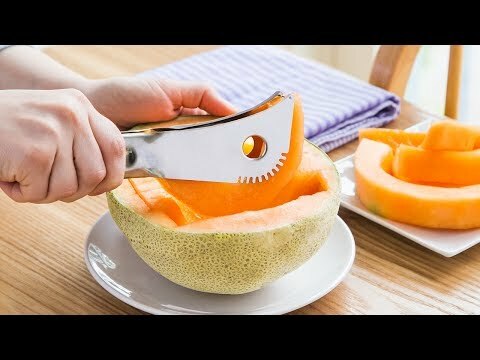 This stainless steel melon slicer makes enjoying honeydew, cantaloupes, and other small melons as easy as making one motion. 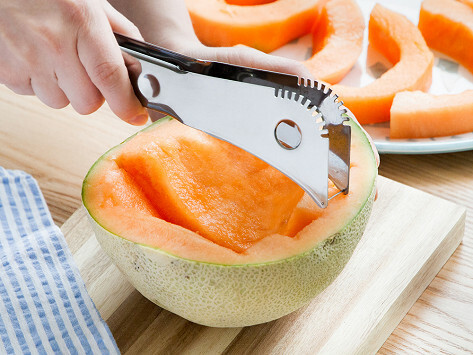 It slices, lifts, and serves in a single movement, so all you’re left with an empty rind and perfectly cut pieces of melon. Dimensions: 7.5" x 2.5" x 1.5"
Works great on melons.easier than the way i was doing it..
We're big fans of the Angurello watermelon slicer, and when we told the Makers we wished it worked better on smaller melons, they listened. Melonello is like a knife and tongs combined into one stainless steel tool. It slices, lifts, and serves melon neatly and evenly in one motion, sans the rind. It’s just as effective and amazing to watch as its larger counterpart that was created for watermelons. But this scaled down design is just for cantaloupes, honeydews, and other smaller melons. The Makers of both tools is i Genietti, a third-generation family company in Tuscany. They’re stainless steel specialists who are always striving to create clever solutions for everyday tasks—hence the name, “The Geniuses”, in Italian. They’ve certainly solved our melon dilemma.